According to police, the mere presence of the camera acts as a deterrent; high quality digital images are stored in a special utility belt. The images are said to be of good enough quality support a prosecution, or in support of an application for an anti-social behaviour order (ASBO). "The new cameras are a fantastic and effective policing tool. "We know they work, supply good quality images and are versatile for patrolling football crowds and shopping precincts. "They can also be used for more intricate work such as dealing with domestic violence or any incident where the photographic evidence will help with a conviction." Trashcan Surveillance - Halt! Who Throws There? No science fiction writer ever thought of putting spy chips in garbage cans - it takes bureaucrats to do that. 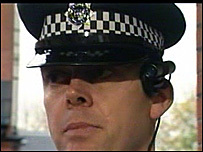 See Beat officer head cameras for more; via VCTB.